The company received unwanted media publicity in the 1980s when rumors spread that the moon-and-stars logo was a satanic symbol. The accusation was based on a particular passage in the Bible, specifically Revelation 12:1, which states: "And there appeared a great wonder in heaven; a woman clothed with the sun, and the moon under her feet, and upon her head a crown of 12 stars." 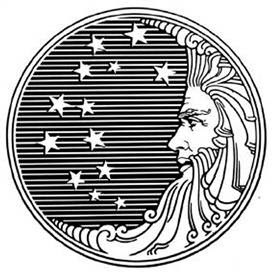 P&G's logo consisted of a man's face on the moon surrounded by 13 stars, and some claimed that the logo was a mockery of the heavenly symbol alluded to in the aforementioned verse, thus construing the logo to be satanic. Where the flowing beard meets the surrounding circle, three curls were said to be a mirror image of the number 666, or the reflected number of the beast. At the top and bottom, the hair curls in on itself, and was said to be the two horns like those of a lamb that represented the false prophet. These interpretations have been denied by company officials, and no evidence linking the company to the Church of Satan or any other occult organization has ever been presented. From my days at Procter & Gamble, and soapmaking, used excessively on days such as this. I wonder how widespread this use is?